Returning serves is hard. It’s the thing most players at the beginner and intermediate levels struggle with the most. It’s easy to understand why. There’s a lot of different spin, speed and placement variations players use when serving. Plus all the different service actions – some short and sharp, others with big exaggerated swings. Returning serves can be very daunting! 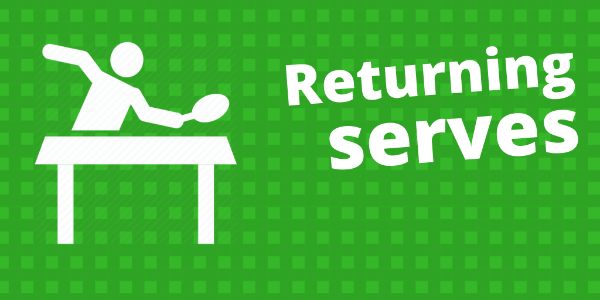 Returning serves is the most common thing players ask me about during my coaching sessions. So we talk about what serve the player struggles with. Then I try my best to replicate the serve. And sure enough, the player cannot return it. But the issue 9 times out of 10 is not that the serve is amazing. The issue is that the player is prodding at the ball. A prod is where a player nervously and cautiously moves the bat slowly to the ball. It’s usually a very short movement, often with a quite a bit of tension. A prod isn’t actually a stroke. It’s nothing. It’s just aimlessly putting your bat in the way of the ball. So what happens when you prod the ball when returning a serve? Usually, the ball flies off your rubber. This is because all the spin from the serve is dominant. A prod does nothing to control the spin or impart new spin. So whatever spin is on the serve will dictate how the ball comes off your rubber. If it’s a backspin serve and you do a prod return, the ball will shoot straight down into the net. If it’s a topspin serve and you do a prod return, the ball will shoot up and off the end of the table. If it’s a side-backspin serve and you do a prod return, the ball will shoot sideways and down off the side of the table. If it’s a side-topspin serve and you do a prod return, the ball will shoot sideways and up off the side of the table. If it’s a no spin serve and you do a prod return, it might actually land on the table (hooray! ), but it’s not likely to be a very good return of serve! So in my coaching sessions, I ban prodding. It will never be effective when returning serves. Prodding is not allowed. I tell my players again and again (until it sinks in), “You have to play a stroke”. You have to control the server’s spin or put your own spin on the ball. So how do you return serves? Which strokes should you play? If it’s a backspin serve, you push. If it’s a side-backspin serve, you push, but aim more to the middle. If it’s a topspin serve, you drive. If it’s a topspin serve, you drive, but aim more to the middle. If it’s a no-spin serve, you could push or drive. Your choice. With this approach, you don’t have to worry about which stroke to play, so you can focus much more on reading the service spin (here’s a video about that). Instead of being fearful when returning serves, you change your mindset and approach it as a positive problem solving challenge. You put all your energy into reading the service spin and then push or drive. It’s such a simple approach, especially for beginner and intermediate players. In a short period of time many players I coach can go from being hopeless at returning my serves (20% success rate) to returning most of my serves, probably with 70%-80% success rate. As you improve, you can even take a more advanced approach and try and topspin or flick most serves, which is quite possible at amateur levels, where serves are often a little too loose (here’s a video about that). But don’t rush to do this topspin approach. If you are at the beginner / intermediate level, I think it’s probably far better to start with the basic approach of playing a push or a drive. You can return most serves by doing this. It’s easier to do to begin with. And it can really help you focus on watching the server, working out spin, and playing a stroke. REMEMBER: DO NOT PROD. YOU MUST PLAY A STROKE! A very good article on reading serves. This is my biggest issue as a beginner. I have been implementing your tips into my game and I’m seeing considerable improvement in my game. Thank you. You are definitely not alone. It is hard to begin with, but does get easier the more you play, especially if you practise returning serves a lot. Great tip, I definitely have a strong tendency to prod. Can you explain what you mean by drive though? A drive is an attacking shot. It’s played with a little bit of topspin, but mainly it’s a flat hit. Other people sometimes call it a ‘hit’ or a ‘counter-hit’. Here’s a video where I demonstrate a forehand drive. Great blogpost, currently I’m not prodding so much more but I too was prodding a lot also at the beginning, I sometimes still do, so it’s good to keep in mind those simple approach options you have written down and when you read it, it sounds so simple…..but somehow we tend to forget that when a match begins!